Pictured Maxwell, who celebrated his 18th birthday during the pre-event test on Friday. Maxwell, who celebrated his 18th birthday during the pre-event test on Friday. 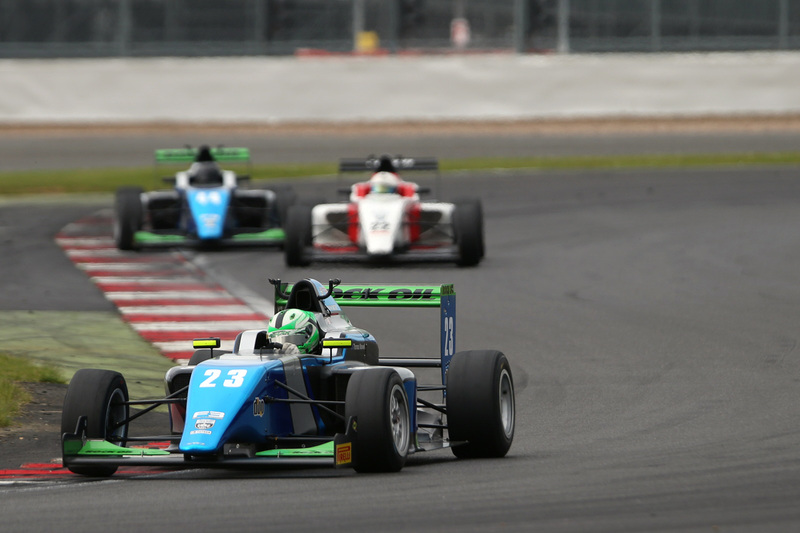 Australian racing driver Thomas Maxwell moved back into the top eight of the BRDC British Formula 3 Championship standings for leading squad SWR at Silverstone Grand Prix Circuit over the weekend, 11th/12th June – an event which was actually halted early due to heavy rain and thunder storms. Maxwell, who celebrated his 18th birthday during the pre-event test on Friday, finished ninth in the dry during round 13 on Saturday to chalk-up his best finish of the weekend. In round 14 on Sunday, the going proved to be trickier on the drying track and the antipodean had to settle for 16th place. 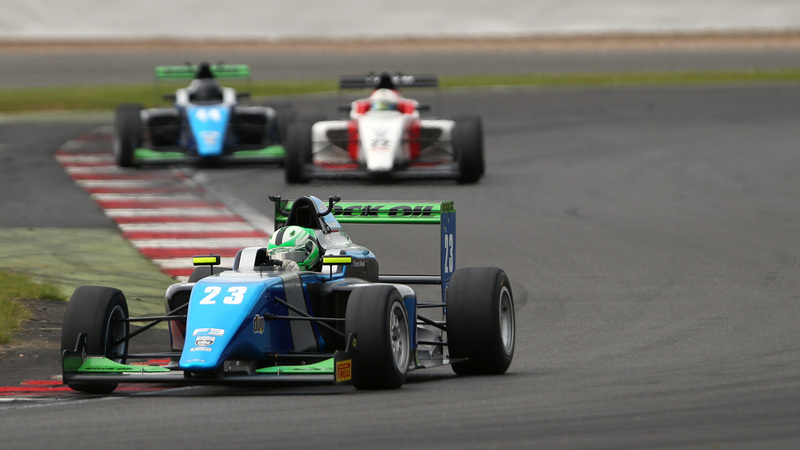 Danish racer Jan Jonck, who produced an excellent season-best showing at Oulton Park two weeks ago, was again SWR’s fastest driver in qualifying and also achieved the Chipping Norton team’s best result of eighth place in the opening encounter. Team-mate Eugene Denyssen made it three SWR cars inside the top 10 during Saturday’s 13th round but had to be satisfied with 14th position in race two, a couple of places behind Jonck. Round 15, scheduled for later on Sunday afternoon, was abandoned due to torrential rain and standing water. “It’s not been the weekend we’d hoped for, but there are some positives to take away – especially from race one where all three guys did a great job”, said team owner Sean Walkinshaw, “Getting all three cars in the top 10 on Saturday was good going and Jan, Tom and Eugene all raced very well. Round 13 began in dramatic fashion when a collision on the grid triggered the Safety Car and, soon after, red flags. At the time of the stoppage, Jonck held an improved eighth place, up from 10th on the grid after a great start, Maxwell was 15th still and Denyssen had climbed into 17th place from 20th position. When the race was re-started over just six laps, the original grid order was utilised but with the cars of Enzo Bortoleto and Krishnaraaj Mahadik missing. Jonck concluded the first lap in ninth place, with Maxwell in 13th and Denyssen up into the top 15 after a strong first tour. On lap two, the SWR trio each gained a place as a result of an issue for Harrison Scott and Jonck thereafter remained in eighth. He took the flag on lap six, just 0.3 seconds behind Toby Sowery who, in turn, was bottled up behind Sisa Ngebulana – Jonck piling on huge pressure to his rivals. Maxwell made continued progress throughout, storming through the order from the eighth row of the grid into ninth position to confirm the clear pace of both driver and car. By the time he had made his way into ninth, team-mate Jonck was too far up the road but their pace was near identical. In the third car, Denyssen almost managed to match his best finish of the season with a fantastic drive to break into the top 10. Steadily working his way through the order from the rear of the grid, the South African completed his rise with a move into 10th place on the final lap. Round 14 on Sunday morning began on a damp track with Jonck starting on pole position on the ‘reverse grid’, as a result of his top eight finish in race one, Maxwell was ninth and Denyssen lined-up alongside his team-mate in 10th position – all three SWR drivers running with treaded tyres. When the lights went out, Jonck made a good start from the outside of the front row and held the lead initially before being edged back to second and then slipping to fourth before the end of the opening lap. Unfortunately, the race didn’t improve for the Dane and he eventually finished the contest in 12th position – the race ending under the Safety Car following an incident. The SWR trio now prepare for the only race meeting of the season not to be held on British soil, rounds 16, 17 and 18 of the championship at Spa-Francorchamps in Belgium on Friday, 8th July, and Saturday, 9th July.